This is a lovely Dino 206 that arrived earlier this fall. It has had a ton of service including a full engine overhaul but it never ran well. We did a little carburetor tuning and checked over some items and couldn’t pin point what was going on. 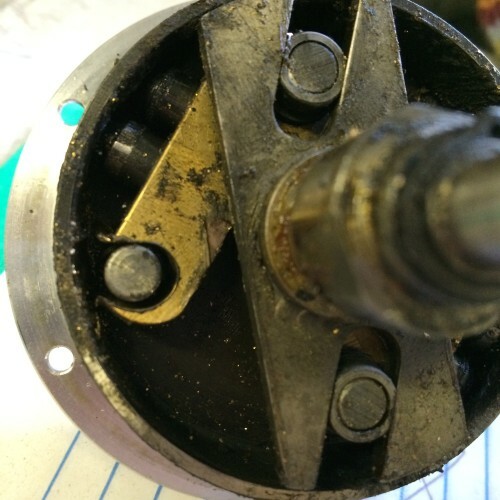 Rolf disassembled the distributor and found this disaster, totally worn out flyweight pivots. They shouldn’t be “C” shaped, they should pivot on the pin with a close tolerance round hole. Once we installed new weights and dialed in the advance curve, the engine ran like a champion. 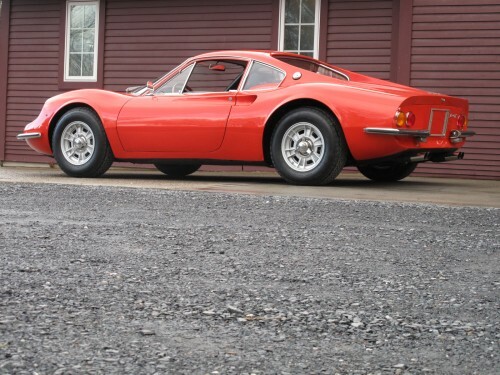 206′s are my favorite of all Ferraris, so small and delicate and stunningly beautiful. 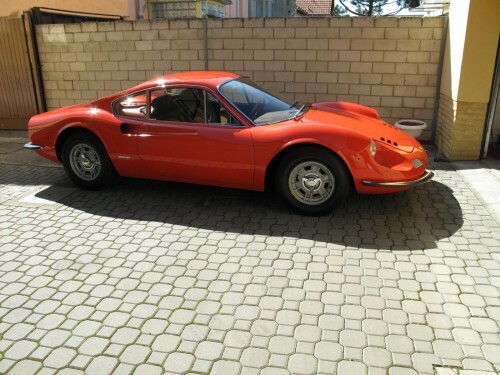 I am working on purchasing a few of them, one of which has a racing Stratos “Doppia Accensione” or “twin plug” engine. Once I sell the 206 at the Gooding auction this January, I hope to have the money to buy this other car. Back in September, I saw this 246 GT on ebay that was owned by a man in Winnipeg, Manitoba across the border in Canada. Based on the photos and description, it appeared to be in similar condition to the 206 that I bought in the Czech Republic back in April 2012. This 246 appeared to have been driven a lot when new but garaged and preserved since the guy bought it in Germany in 1981. In the late 80′s he imported the car to the United States, then into Canada. While the guy didn’t restore or service the car, he didn’t let it deteriorate too badly. I think ebay is great but lately I refuse to bid on higher value items because people use that “snipe” app which I can’t compete with nor do I want to! I hate that stupid app because I just end up bidding against myself because the high bidder doesn’t even have the money to buy the item! In the last year I’ve had about a dozen or so “second chance offers” because the “high bidder” isn’t really prepared to buy the item. Needless to say, I didn’t want to buy this car on ebay! So, I emailed the seller of this 246 GT asking him to contact me if the car didn’t sell on ebay and sure enough, two days later a man called me from Winnipeg! He reached out to the high bidder through ebay messages, email, and phone but he couldn’t be found so we quickly stuck a deal and I sent him a check. Mackey Group shipped the car from Winnipeg to my friend Jerry’s warehouse in Montreal so I could drive it across the border between Vermont and Quebec. Thankfully, the cold and snow held off and I got it to the border without drama, but one mile into the U.S. on I-89, the car ran out of gas! Here is a photo of it on the side of the road. The car is now for sale at the shop. I checked it over and while it has some needs, its a totally complete and straight car that’s ready to be serviced and driven, or broken down for restoration. “L” series cars are more like the 206 Dino having center lock wheels, folding foot rest and that funky long glove box door. One of my favorite features is the wood rim steering wheel which was missing on this car so I just purchased one from a friend to make this a more accurate example. We take care of a few Ford GT’s at our shop but this one has really stopped me in my tracks. While I like interesting colors, I am not into flashy colors but this GT in red looks incredible. This car has only 500 miles and is unmarked in every way. We sold it to one of our best customers who is just as blown away by the car as I am. So often we try to repair old parts to maintain originality or because new stuff isn’t available and if I tallied up the hours spent patching the often rusted and mangled brake fluid reservoirs for Ferrari 250′s I’d get really depressed. I found a few of these New Old Stock reservoirs with the correct caps and quickly bought them all! Since I have a few more than I need, I’ll sell a few. 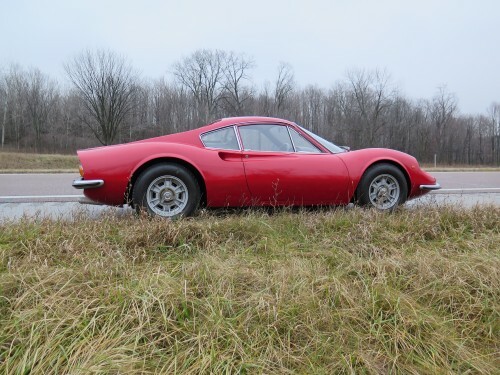 Awhile back I published a post on reproducing the often broken or missing vents and knobs for the Ferrari 330 and 365′s that showed the prototype to review before the final production. The final order of vents have arrived in a box and I challenged myself to make the delicate and finely detailed knobs that go in the middle of them. Late production 330 GT 2+2′s had optional Air Conditioning with 3 louvered vents in the middle of the dash with little thimble sized knobs that you twist to both direct the air flow and operate the fan speed and temperature of the A/C system. The middle vent had a blank knob and the outer vents said “aria” I II III (for the three speed fan motor) and the other outer vent had a knob that had the script “freddo” that controls the temperature of the air outlet. I found some very good original knobs and cleaned them up, chipped the white paint out of the script and sanded the delicate fluted lines on them to make a good mold. Then I made tooling to make consistent parts time after time to fit the “D” shaped switch shafts. The results are amazing, I am so impressed at how great everything came out. I didn’t make the louvered vents, these parts were extremely complicated because the outer cylinder of the vent is on a different angle than the louvered slats, how do you make a mold that not only pulls apart straight but allows the louvers to be on a 45 degree angle! Since I paid the big bucks, I own the multiple piece mold and may tell you the secret someday. The only part I have not made are the chrome trim rings that go on the outer edge of the vent. Later this month the tooling will be finished up to stamp them out of brass and have them chrome plated to match the rest of these lovely little parts. Since I haven’t posted anything in awhile I thought it would a good re-entry to post a few photos of the 206 Dino that Roman and I delivered just before Christmas. The car has made a nice progression from when we first got it, wheels re-painted, bumpers repaired and chrome plated, all suspension corners were taken apart and rebuilt. 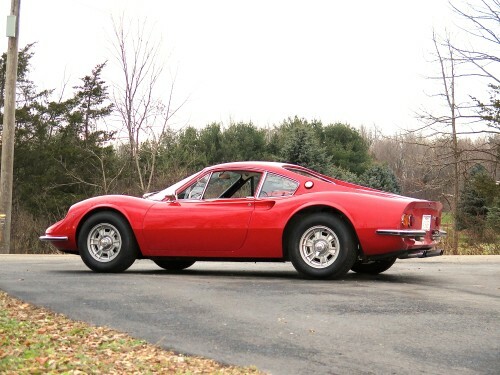 This is one of the best Ferrari’s I have ever driven. What makes antifreeze go from alkaline to acidic? Does combustion gas leak from the head gasket and contaminate it or is it the heating and cooling process? Regardless, we have had two corrosion situations from acidic coolant recently, a pair of 330 cylinder heads and the core plugs in a 365 GTB/4 Daytona. To be fair, the core plugs are very soft alloy in comparison to the engine block so they are kind of sacrificial, unfortunately they are difficult to change. These plugs were so delicate that just by scraping the crusty coolant off to find the source of the leak, the screwdriver poked right through them like they were made from waxed paper. The 330 heads are a combination of a bad casting and corrosive coolant. I saw a youtube video showing the process of building a modern Ferrari 612 engine where an MRI test was used to determine the thickness and integrity of a cylinder head casting. They didn’t have this technology in 1966 and this is the evidence of it! The deep pores in the exhaust port aren’t from corrosive coolant, it’s from a horrible casting. The pitted areas around the water passages are due to corrosive coolant rotting the material away. Like a dentist, I drilled and scraped the corrosive material out so I could weld the holes that were leaking coolant into the exhaust and intake ports. I don’t often remove valve seats and realize what a difficult job it is but I found a great way to get them out easily. I take a valve with the same size stem as the original (8mm for Ferrari) but has a slightly smaller head. I weld the head to the seat and drive the valve and seat out with a hammer from the back side! Anyhow, after welding, grinding, pressure testing a number times, I finally have the heads sealed up and looking great. After grinding and cutting the core plugs out of the Daytona block, we installed the new ones and sent the car home. 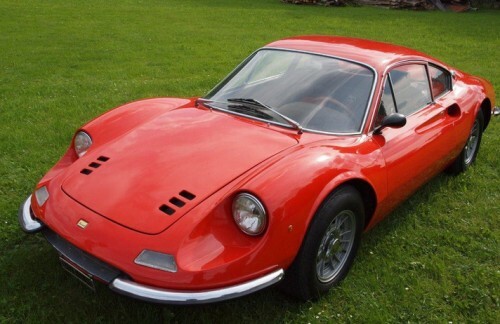 In 1966 Ferrari began installing Air Conditioning as a factory option in the 330 GTC and 330 2+2 using many U.S. sourced parts such as York Compressors and Aeroquip hose and fittings. Since the cosmetic appearance matters as much as physical appearance, I have gone through great lengths to find the original specification parts to repair A/C systems in factory equipped cars and to assemble kits to sell to people wishing to install A/C in their car. I have jigs to make the evaporator housing under the dash and have patterns to make the compressor brackets. There are thousands of different drier bottles available but the style used on Ferrari’s is the hardest to find and I have a little stash of them to make the system look just right. The Pressure switch was a total pain to locate because it isn’t a automotive A/C part, it is a commercial refrigeration part so after a bunch of research, I have these parts too. The last part that I am struggling with are the cold air vents that have a opening in the center for the fan speed and temperature switches. I have decided to re-make these vents to sell with the kits and to have them available for sale separately because the originals are brittle and break easily. To make the louvered vent set complete, I am making the chrome plated trim and “Aria” and “Freddo” knobs to fit on the switches. These photos are the prototypes that need to be reviewed before final production and other than one minor change, they look fantastic. 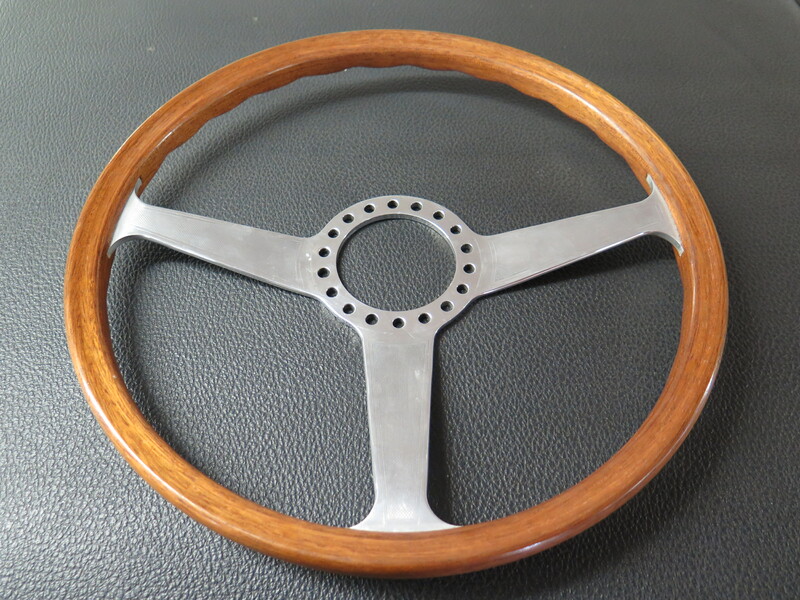 In the next month I will finish the trim parts and knobs and I will have car sets available for sale. Ruby and I had a look at the 206 on Friday, I really like the car. The interior is so cool because unlike most 206′s, it has the original seat upholstery with a loose weave pattern that can easily tear from a rivet on your jeans. 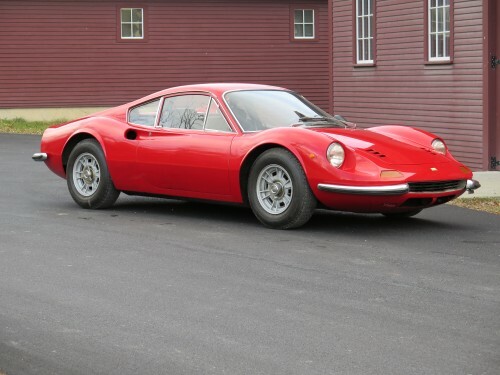 On Thursday, my daughter Ruby and I are going to Europe to look at a car that I put a deposit on, this super rare and original 1969 Ferrari 206 GT. When I asked her if she wanted to go she said “no” but I don’t care, she’s going with me. We’re flying into Vienna and renting a car to tour around a little and see a city that my friend Pete says is outstanding, Bratislava in the Czech Republic. Pete has traveled all over the globe and loves Eastern Europe so much that he has pitched his travel show idea to a number of networks in the last few weeks. This guy is a real character and I think he has a sure shot at being on T.V. with amazing stories that he’s posted on Motley Planet. Anyhow, this car is supposed to be exceptionally original with low miles and only two owners from new. 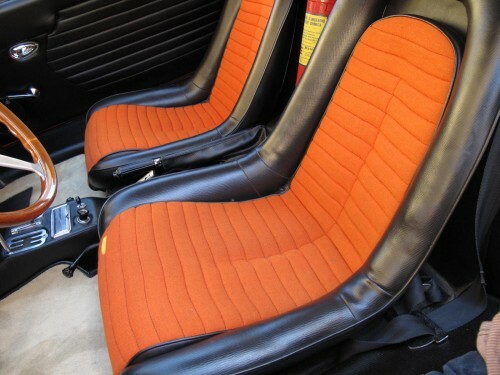 It even has the cheap orange crushed velour that is vaporized on almost all other 206′s which is testament to its originality. If the car meets Ruby’s ultra critical standards, the freight forwarders I use in the Netherlands will get the car to Port Roosendaal for delivery to Port Elizabeth in New Jersey by vessel. Ruby and I will take a bunch of photos so we can share them while the car is locked in a container with containers of tulips and wooden clogs stacked on top and all around it for 3 weeks. Copyright © 2012 Ferrari Craft. Powered by WordPress and A Dream to Host theme by Art of Blog.